How to Join Grammarly Affiliate Program? Can You Earn from Grammarly Affiliate Program? How Grammarly Pay to their Affiliates? 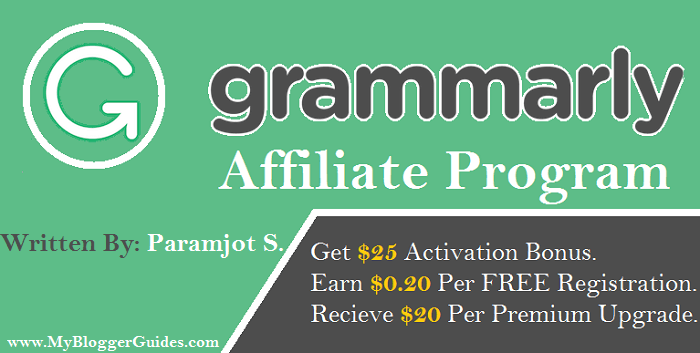 Grammarly is one of the best affiliate programs to join and promote on site. It is suitable for both; an internet marketer & and also for visitors. If you want to earn good bucks in short time, then you should join this affiliate marketing program right now. Hello. Want to know about the Grammarly affiliate program? Okay, you’re at right place because I came up with complete information about it. Yesterday, I was searching for best affiliate programs for myself, and suddenly I found Grammarly Affiliate Marketing Program and seriously I was amazed by their offers.Are you thinking, why I was amazed? Actually, Grammarly Affiliate Program offers you $25 activation bonus and $0.20 on every free sign up. It means if you have enough traffic on your blog then you can make a good amount of money through Grammarly Affiliate Program. If you don’t know, what the hell is Grammarly then you should read one of my previous article where I’ve written in details about it. Must Check – Grammarly Review. So, If you want to make money online through your blog & website, then I must say Grammarly Affiliate Program is the best affiliate marketing program to earn online money, and you should try it once. As I already mentioned above, Grammarly paid you $0.20 on every free signup (When someone clicks on your affiliate link and do signup.) and later, if the user upgrades his plan then you’ll get paid $20. It means you can easily make $10-$50 per day by this CPA (Cost Per Action) program. Click on this link to Join Grammarly Affiliate Program. If you are fed up with your old affiliate products, and you’re not making good money then must try Grammarly Affiliate Program because it can be an excellent choice for you to switch to this new money making product. Earn $0.20 on each free signup. Trusted company working with leading universities. Extra Generous 90-day cookie window. Dedicated full-time affiliate program manager. Custom links, creatives, program terms and co-branded landing pages available. Highly versatile educational product for all audiences (i.e. educators, students, professionals). It’s simple and easy to promote and earn. After joining you can also access their premium services for one month. First of all, you need to click on this link to signup. – Click here to Sign Up. Fill all required details and hit on sign up button. Now, wait for 2-3 working business days, and Grammarly will send you a confirmation email. Once you get approved to Grammarly Affiliate Program, then sign in to dashboard and place affiliate banner & tracking links on your website/blog to promote Grammarly. You’ll get paid $25 as a bonus when you’ll write a Grammarly Review blog post. Grammarly is one of the best and most recommended online grammar checker tools for students, teachers, and students. There are lots of Affiliate Marketing Programs available such as Clickbank, ShareASale, V Commission, Commission Junction (CJ), and Affiliatevia. But I can say now Grammarly Affiliate Program is the best program that can fill your pockets with money. You don’t need millions of views to earn through this program. If you have only 500+ daily unique visitors, then you can easily make $10-50 per day. I love to promote Grammarly on My Blogger Guides. If you want to try your hands with Grammarly Affiliate Program then don’t worry about payment method because Grammarly offers several options to receive payments like as; Wire Transfer, Direct Deposit, and also via Payoneer. So above I’ve shared “Grammarly Affiliate Program, ” and I hope you enjoyed this article. If you face any type of problem, then please let me know by dropping your comment. Do you want me to write more about other money making products just like this Grammarly Affiliate Program? If you want then, please let me know by using below comment box. Don’t forget to subscribe us and also do share this post on social sites.